She is the primary protagonist. 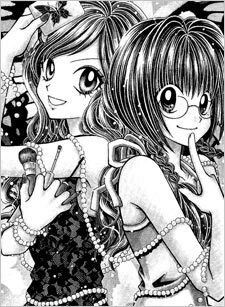 She hides under a secret identity, as Ageha, who gives makeovers to girls in secret. She wears makeup to disguise herself as Ageha. While she has her makeup on, she has a different personality, as she is more confident and outgoing. She plans to reveal herself after she collects 100 Ageha's card. She was teased by her looks as a kid and felt uncomfortable. So, she was given her makeup box by the former "Ageha". When she didn't put any makeup on, she wear her glasses and she is very shy. Rin lives with her grandparents and even hides her 'other side' from them because thay dislike make-up. Later in the series Rin will develop feelings for Riku. She herself doesn't know what that feeling was called until she asked one of her clients. That's how she realized she's in love with Riku.